Child in Mind: A Conversation with Nadine Burke Harris: How Should Pediatricians Address Childhood Adversity? A Conversation with Nadine Burke Harris: How Should Pediatricians Address Childhood Adversity? 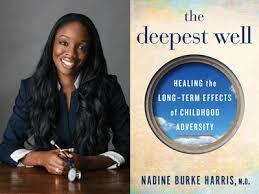 Pediatrician Nadine Burke Harris is a masterful storyteller. I learned in a conversation with her at Wheelock College before her presentation for the Brookline, MA organization Steps to Success, that before she decided to become doctor, Dr. Burke Harris wanted to be an author. Only after the smashing success of her TED talk: How childhood trauma affects health across a lifetime, when she was approached by a literary agent, did she find her way to writing. Her newly released book The Deepest Well: Healing the Long-term Effects of Childhood Adversity is filled with engaging stories that intertwine personal experience and scientific discovery. Now on the road promoting the book, Burke Harris is able to put her storytelling skills to use in spreading the important messages of her work. In the book, Dr. Burke Harris describes the convergence of two events. First, while working at a clinic that she founded in a high needs, low resourced community in San Francisco , she observed that children with ADHD, asthma, and other common childhood illnesses had experienced massive levels of adversity. Then fortuitously, a colleague showed her the CDC- Kaiser Permanente co-sponsored Adverse Childhood Experiences (ACE) study, that offers dramatic epidemiological evidence of the high correlation between 10 adverse childhood experiences and negative health outcomes both physical and emotional. As an example of her skill at vivid communication, in describing this moment of discovery Dr. Burke made a "whoosh" sound to accompany the visual depiction with movement of her hands that, "the top of my head blew off." Now Dr. Burke Harris is a woman on a mission to make ACEs screening an integral part of pediatric care. The launch of her book tour coincided with the website for this initiative NPPCACES (The National Pediatric Practice Community on Adverse Childhood Experiences) going live. The hope is for all pediatricians to give parents a "de-identified" screen. Those with a high score go on to another level of care. As a pediatrician specializing in the developmental science of early childhood, I was interested to learn from Dr. Burke Harris how the she sees the science of ACEs impacting on the way we care for parents and infants. Toxic stress, defined as stress in the absence of safe, secure caregiving relationships, is a mechanism by which adverse experiences get under our skin and wreak their long-term havoc on our health. I wondered if the clinicians whose main task is to support these relationships might be the front line of care, with the pediatrician as the specialist. While Dr. Burke agreed in theory she said, “we’re not there yet." She went on to explain, "The medical specialist is the authority," She see the entry point for integrating ACES as firmly embedded in the medical model. She does not want to force pediatricians to take on the role of promoting relationships, which is not what many have signed on for. As an example, she said that pediatricians will more likely embrace screening for ACEs if they see that it will help in management of asthma, revealing which patients may benefit more from decreasing adversity than from treatment with bronchodilators. Once they see the high prevalence of ACEs, as was demonstrated in the original study and has been replicated in many, then they may come around to a focus on supporting relationships. I was also curious about the poignant stories in the book where she comes up against resistance. At a meeting where she had to step out to pump breast milk for her infant son, she returned to find people describing her as “that doctor from San Francisco telling us that our kids are brain damaged.” While most people depicted in her book find learning their ACE score to be deeply empowering, a subset experience it as victimizing and blaming. When I raised the question of what might lead a person to have a negative reaction, immediately Dr. Burke Harris gave an impassioned defense of screening to address what she describes as a public health emergency. She likened the problem of a negative reaction to a side effect of a life saving antibiotic. We agreed that identifying a subpopulation that might have a negative reaction to screening would mitigate this risk. At Montefiore Medical Center where ACEs screening has been implemented, pediatricians explain to parents that higher ACE scores are tied to long-term impact on their child’s health. But as Dr. Burke Harris herself described, when we feel threatened, the thinking parts of our brain do not function well. Perhaps some of the people who resist cannot hear this rational explanation. As I listened to her presentation following our conversation, the work of neuroscientist Stephen Porges came to mind. His research shows that under situations of overwhelming threat, rather fight or flight a third response of our nervous system, under the influence of the primitive vagus nerve, takes over. Not only does our thinking brain go “offline” but also the muscles of the middle ear literally do not function normally. When people feel safe, the “smart” vagus of the parasympathetic system comes online and we are able to listen and connect. When we listen with our whole being, we can diffuse a lot of bombs. . . . If there is someone capable of sitting calmly and listening with his or her heart for one hour, the other person will feel great relief from his suffering. I wonder if ACE screening is a form of communicating to parents, "I recognize your suffering and I am here to listen." If so, then universal screening offers a clear path to healing. Part of the problem here is a sort of catch-22 which you noted in your email exchanges with me. Instead of hearing "I recognize your suffering..." parents these days hear "Your kids' problems are all your fault." Pharmaceutical companies are quick jump in and say the problem is entirely within the kids' defective brains. In psychotherapy, the therapist can use empathy to counter the inherent paradox of "you need to parent differently, but you are blameless." In public forums, this is much harder to handle. Vis-à-vis the vagus, I wonder if a "shut down" response can become a chronic response to chronically unresponsive caretakers as a child, which then carries over into adulthood? Yes the Polyvagal theory as described by Dr. Porges adds an important dimension to the question of how trauma comes to live in our bodies. It is in alignment with Ed Tronick's Still Face research showing that patterns of relating with primary caregivers become integrated into our relationships but with an emotionally unavailable caregiver, eg a depressed mother with a chronic "still face" these patterns of relating become maladaptive in our social interactions going forward. I just finished reading The Deepest Well and despite everything I already knew about ACEs found it fresh and inspiring and loved her humor and examples of how she has learned to incorporate ACEs screening and support into her medical practices. I'm a former family doctor who retrained as a somatic psychotherapist and then specialized in trauma therapies. Porges' work, freeze states, understanding attachment & development from these neurobiological perspectives - it all changes how we think of and understand health in such profound and inspiring ways. I've specialized in chronic illness and see it from a similar view point as you and Burke Harris express - an altered physiological state reflecting a nervous system (and hence so many other systems) caught in fight / flight / freeze at the cellular / biological / physiological levels. It brings in so much hope - even as we continue to work with the resistance, shame and blame that it elicits in some. I find this negative reaction to be very strong in the chronic illness community, so many of whom have been told their (often difficult-to-diagnose) symptoms or diseases are psychological or "all in their heads" if there is a history of trauma. Thanks so much for sharing your conversation. I'm thrilled to see that you have a book out on these views of development :-). It's exciting to see this information coming into medical care, even if it is a slow process.